I saw the car in person and it is absolutely stunning. However some say it is “cushy” for a Porsche. I guess we will find out soon enough. Below is text from Porsche itself. 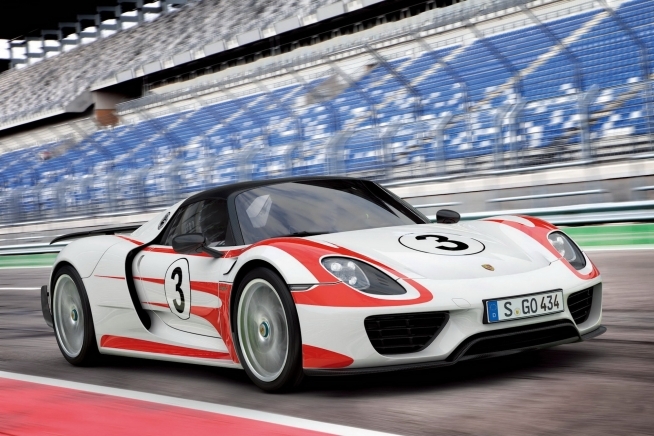 The Porsche 918 Spyder has been greatly influenced by its affiliations with motorsport. A number of the developments to the Porsche race car for the 24 Hours of Le Mans 2014 were used in the 918 Spyder – and vice versa. The structural concept, which is based on a rolling chassis (i.e. a chassis without bodywork), is standard for Porsche race cars. The design of the V8 engine is based on that of the Le Mans Prototype 2 (LMP2) race car, the RS Spyder, and the supporting monocoque structures and unit carriers are made from carbon fibre reinforced plastic (CFRP). More importantly, however, the Porsche 918 Spyder is considerably more fuel efficient than any of its competitors. In fact, this plug-in hybrid combines the performance of a race car with an output of over 880 bhp with an estimated NEDC fuel consumption of just three liters per 100 km, which is lower than the majority of today’s compact cars. Drivers can therefore enjoy maximum driving pleasure and minimum fuel consumption. The core message surrounding the 918 Spyder is that the Porsche hybrid drive offers uncompromising dynamic performance. The unique all-wheel drive concept with a combined combustion engine and electric motor drive system on the rear axle and a second electric motor on the front axle make this possible. This concept is based on Porsche’s motorsport development work for the successful 911 GT3 R hybrid. The additional, individually controllable front-wheel drive enables new driving strategies to be used for extremely high yet safe speeds through bends in particular. What’s more, the advanced “boost” strategy manages the energy of the electric drive so intelligently that the unrestricted total power of the 918 Spyder can be accessed simply by fully depressing the accelerator pedal for every burst of speed at maximum acceleration. In short, the Porsche 918 Spyder allows even drivers without motorsport training to experience the potential of advanced longitudinal and lateral dynamics. When the vehicle is started up, “E-Power” mode is selected as the default operating mode, provided that the battery is sufficiently charged. Depending on load, the 918 Spyder can cover between 16 and 32 kilometers on purely electric power. Even in pure electric mode, the Porsche 918 Spyder accelerates from 0 to 100 km/h in under seven seconds and can reach speeds of up to 150 km/h. In this mode, the combustion engine is used only when needed. If the battery charging condition drops below a set minimum level, the vehicle automatically switches to hybrid mode. In “Hybrid” mode, the electric motors and combustion engine work alternately, focusing on achieving maximum efficiency and minimum fuel consumption. The power output of the individual drive components is modified in line with the current driving situation and the required performance level. Hybrid mode is typically used for fuel-efficient driving. If a more dynamic performance is required, the power units in the 918 Spyder switch over to “Sport Hybrid” mode. The combustion engine now operates continuously, representing the main propulsive force. The electric motors are activated to support acceleration through the electric boost function, or at points when the operating point of the combustion engine can be optimized for greater efficiency. This mode focuses on performance and a sporty driving experience at top speeds. “Race Hybrid” is the mode for maximum performance combined with an especially sporty driving experience. The combustion engine is chiefly used under high load, and charges the battery whenever the driver does not require maximum power. The electric motors provide additional support in the form of boosting in this mode too. The gearshift program of the Porsche Doppelkupplung (PDK) is also designed for even sportier driving. The electric motors are used up to the maximum power output limit to deliver the best possible performance for the race track. In this mode, the battery charging condition is not kept constant and instead fluctuates over the entire charge range. In contrast to Sport Hybrid mode, the electric motors run at their maximum power output limit for a short period for enhanced boost performance. This increased output is balanced out by the fact that the combustion engine charges the battery more intensively. The electric power boost is thus always available to the driver even for several very fast laps. The “Hot Lap” button in the centre of the map switch releases the 918 Spyder’s final reserves and can only be activated in “Race Hybrid” mode. Similar to a qualification mode, “Race Hybrid” mode pushes the traction battery to its maximum power output limits for a few fast laps. This mode uses all of the available energy in the battery. The main drive source is the 4.6-liter, eight-cylinder engine with an output of up to 608 bhp. Based on the power unit of the successful RS Spyder endurance race car, the engine delivers engine speeds of up to 9150 rpm and a power output per liter of approx. 132 bhp/litre – 26 bhp/liter more than that of the Carrera GT, making this the highest specific power of any naturally aspirated Porsche engine. And it is not just the performance of the 918 Spyder engine that stirs up an emotive response: The sound of this vehicle is just as impressive, and can primarily be attributed to the “top pipes” – exhaust tailpipes that terminate directly above the engine in the upper part of the rear end. No other series production vehicle features this solution. The V8 engine is coupled to the hybrid module as the Porsche 918 Spyder is designed as a parallel hybrid like Porsche’s current hybrid models. The hybrid module essentially comprises a 115-kW electric motor and a decoupler that serves as the connection with the combustion engine. Because of its parallel hybrid configuration, the 918 Spyder can be powered at the rear axle either individually by the combustion engine or the electric motor, or via both drives together. As is typical for a Porsche super sportscar, the power unit assembly in the 918 Spyder has been placed in front of the rear axle, and it does not have a direct mechanical connection to the front axle. A seven-speed Porsche Doppelkupplung (PDK) transmission handles power transmission to the rear axle. The electric energy for the electric motors is stored by a liquid-cooled lithium-ion battery comprising 312 individual cells with an energy content of approximately seven kilowatt hours. The battery in the Porsche 918 Spyder has a performance-oriented design in terms of both power charging and output, enabling it to meet the performance requirements of the electric motor. The power capacity and operating life of the lithium-ion traction battery depend on several factors, including thermal conditions. This is why the 918 Spyder’s battery is liquid cooled by a dedicated cooling circuit. The global warranty period for the traction battery is seven years. The Porsche 918 Spyder’s multi-link chassis was inspired by motorsport design, and is complemented by additional systems such as the Porsche Active Suspension Management (PASM) adaptive shock-absorber system and rear-axle steering, which is essentially an electro-mechanical adjustment system at each rear wheel. This adjustment is speed-sensitive, providing steering angles of up to three degrees in each direction. On the one hand, the tyres needed to have optimum grip and razor-sharp handling on all road types. On the other hand, the tires needed to be durable on the racetrack and have as low a rolling resistance as possible. As a result, the developers of the Michelin Pilot Sport Cup 2 tires for the Porsche 918 Spyder were faced with a seemingly insurmountable conflict of objectives. However, working closely with Porsche engineers, the tyre experts from Michelin were able to overcome this challenge in impressive fashion: The 918 Spyder is rolling out of production facilities exclusively on specially tuned Michelin Pilot Sport Cup 2 tires. A total of 550 prototype tires were produced and tested over the course of the testing period. 400 preproduction prototypes and 200 series test specimens were also produced before Porsche gave the final approval for the Michelin Pilot Sport Cup 2 tires in size 265/35 ZR 20 for the front axle and 325/30 ZR 21 for the rear axle. The tires developed specially for the Porsche 918 are also raising the benchmark in the ultra sports tyre segment when it comes to driving on wet surfaces and in terms of aquaplaning safety. The Porsche 918 sees this exclusive partnership between Michelin and Porsche in the development of special tires for super sportscars entering its second phase. This partnership started more than ten years ago with the Carrera GT. For customers looking for an even better performance from the 918 Spyder, Porsche also offers the “Weissach” package. Super sportscars modified with this package are also available in special colors and designs inspired by legendary Porsche race cars, making them instantly recognizable. The emphasis on performance is not just visual: Super lightweight magnesium wheels reduce the unsprung weight, decreasing the gross weight by around 35 kg. These lightweight features are decisive when it comes to further enhancing the dynamic performance of the vehicle. Other references to motorsport include six-point seatbelts for the driver and front passenger, an optional film coating instead of a paint finish, plus additional aerodynamic add-on parts in visible carbon fibre. In “Race” mode, the retractable rear wing is set to a steep angle to generate high downforce at the rear axle. The spoiler, which is positioned between the two wing supports at the trailing edge of the airflow, also extends. Two adjustable air flaps are opened in the underbody in front of the front axle, directing some of the air into the diffuser channels of the underbody structure to also produce a “ground effect” at the front axle. In “Sport” mode, the aerodynamics control system reduces the approach angle of the rear wing slightly, enabling a higher top speed. The spoiler remains extended but the aerodynamic flaps in the underbody close, which also reduces aerodynamic drag and increases the potential vehicle speed. In “E” mode, the system focuses solely on low aerodynamic drag; the rear wing and spoiler are retracted and the underbody flaps are closed. Adjustable air intakes under the main headlights round off the adaptive aerodynamics system. When the vehicle is stationary and in “Race” or “Sport” mode, the intakes are opened to enable maximum cooling. In “E-Power” and “Hybrid” mode, the air intakes close as soon as the vehicle is driven off in order to keep aerodynamic drag to a minimum. They are not opened again until the vehicle reaches speeds of approximately 130 km/h or when cooling requirements are higher. As a super sportscar designed for everyday use, the Porsche 918 Spyder offers a spectacular top-down driving experience. The two roof panels made from carbon fibre-reinforced plastic (CFRP) are removable, as is the tradition at Porsche, and can be stored securely in the 100-liter luggage compartment located at the front of the vehicle.